Last May, the state Department of Health Care Services (DHCS) implemented the new “Health For All Kids” law allowing California children under 19 to receive full Medi-Cal benefits, including dental care and mental health, regardless of their immigration status. Previously, undocumented children could receive only emergency care through Medi-Cal. Medi-Cal is California’s version of the federal Medicaid program for people with low incomes. The federal government pays for a significant portion of the California program, as it does for all states. But coverage for undocumented kids is entirely funded by the state. From last May to through April 6, 189,434 undocumented children signed up for the program, according to the most recent state data. The health care services department estimates that another 61,000 children are eligible but not enrolled. Advocates say now is the time for a push to sign up these “harder-to-reach” children and to encourage those already in the program to stay. 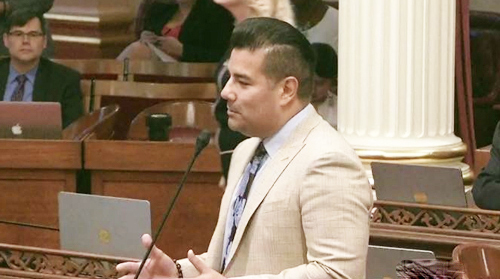 In an interview with California Healthline in February, Sen. Ricardo Lara (D-Bell Gardens), who authored the Health for All Kids law, said there was no reason for people to be concerned about the program’s durability. New America Media – A sweeping bill that will expand health care coverage to California’s undocumented population sailed through the State Senate Wednesday on a 28 to 11 vote. All 26 Democrats on the Senate, plus two Republicans – Assemblymembers Anthony Cannella (R-Ceres) and Andy Vidak (R-Hanford) — gave the bill their nod. The bill, if passed by the Assembly and signed by Gov. Jerry Brown, would allow undocumented Californians to buy health insurance with their own money through the online exchange, Covered California, pending permission from the federal government. Senate Bill (SB) 4 gives all adults, regardless of their immigration status, access to health care, but it would not be an entitlement. It would only cover those enrolled up to a capped budget level each year in Medi-Cal (California’s name for Medicaid), the health insurance program for low-income people. However, another provision of SB 4 that would allow all children, 19 and under, to enroll in Medi-Cal, would entitle all who qualify to received health benefits, no mater how limited the program’s budget is. In May, the Senate Budget Sub-Committee set aside $40 million to begin covering children who are among the state’s nearly 2.5 million residents remaining uninsured because they don’t qualify for full-scope Medi-Cal because of their immigration status or their income level. The committee made the $40 million allocation after the Senate Appropriations Committee scaled back the cost of SB 4, pegged earlier as $740 million. A stalled version of the bill last year came with a $1.4 billion price tag. Although legislative analysts have not yet estimated the total cost of the scaled back plan, providing Medi-Cal to the state’s 200,000 or so undocumented children could run anywhere between $7 million and $135 million. But president Obama’s executive action on immigration could greatly reduce those amounts. “Once Obama’s executive action moves forward, the cost could drop to between $4 million and $83 million,” asserted Ronald Coleman, government policy analyst with the California Immigrant Policy Center. The executive action, announced by the President last November, would grant a three-year renewable deportation reprieve to 5.6 million undocumented people nationwide by expanding the Deferred Action for Childhood Arrivals (DACA) program, as well as by launching the Deferred Action for Parents of Americans (DAPA) program. An estimated 1 million California residents could benefit from the programs, which are now suspended pending decisions on federal court lawsuits. Immigrant and health care advocates in California hailed the passage of SB 4 in the Senate. If the Assembly Health Committee, where the bill is now headed, approves SB 4, the Assembly Appropriations Committee has to come up with its own price tag for the bill. Both chambers would then have to reconcile the funding amount before the bill reaches the governor’s desk.